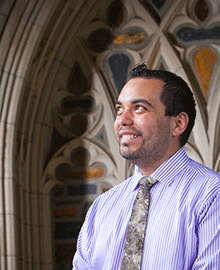 Eladio Bobadilla is a first-year PhD student in history. He studies immigrant labor history and Chican@ political identity. A native of Mexico and the son of life-long farm laborers, he is interested in investigating the social history Mexican “guest” and undocumented workers in the United States. He is especially interested in the development of a political consciousness among these people and the ways in which their experiences have shaped their views of both the United States and their countries of origin.